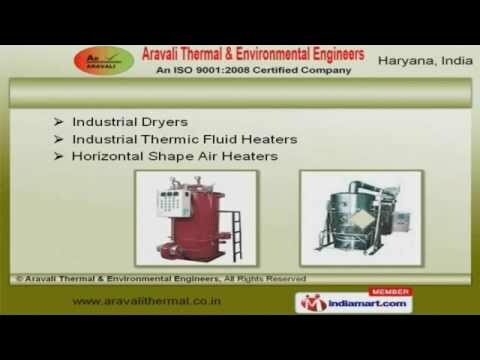 Welcome toÂ AravaliÂ Thermal and Environmental Engineers, Manufacturer and Supplier of Hot Air Heaters, Incinerators, Burners andÂ HVACÂ Systems. An ISO 9001 2008 certified company, established in the year 2012. Our Strict quality control measures and adroit team of professionals helps us to grab maximum customer satisfaction. Impeccable quality products, industry leading prices and customized solutions make us the first choice of our clients. We offer a wide array of Waste Incinerators, Portable Autoclaves and Hot Air Heaters. Air Handling Units, Industrial Heaters and Boilers offered by us are superior in performance. Our Horizontal Shape Air Heaters, IndustrialÂ ThermicÂ Fluid Heaters and Dryers are extremely reliable. Cylindrical Shape Air Heaters and Waste Incinerators for Hospitals are acknowledged for their functionality. Industrial Boilers for Jewellery Clearing Industry and Floor Mounted Air Handling Units for Offices are a class apart. Our Steam Boilers for Process Heating and Textile Industries are cost effective.